This is a two disk set designed to cover the basic skills required to master the nationally recommended 1st and 2nd grade curriculum guidelines. Similar in structure to other multidisciplinary skill-building programs, such as those in the "Jump Start" series, it includes a wide variety of activities at three skill levels. The program also includes a progress checker, which allows teachers and parents to check on the progress of every child using the program, and a sample package of 'Avery Kids' printer supplies that can be used in conjunction with the Art Studio section of the program with gratifying results. Accompanied by our favorite french waif (Madeline) as guide, the user is entreated to enter and explore the many shops and businesses that line 'Main Street'. Contained within each location is an enjoyable activity that teaches and strengthens essential skills. Many of these activities can be experienced in English, Spanish or French, making the program challenging for older children who want to rehearse their foreign language abilities. 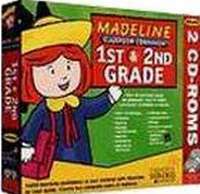 Throughout the program, Madeline provides cheerful companionship in her inimitable manner, while offering helpful tips.